Have you looked at the faux cotton boll stems in stores? Then, did you do what I did? I looked at the price and silently screamed "yikes" in my head, and left them at the store. Well, just look at these beauties. Prodigal Pieces has a tutorial for making them. Please remember to go to the original site to pin or share these images. Yes, I know I am posting Friday Faves on Saturday. I've had a busy week. The older I get, the more Dr. appointments I have. No, there's nothing seriously wrong with me, but this week, I have had to get stronger lenses for my glasses, get two hearing aids (!!! ), and set up medical tests. Getting old is a lot of work! 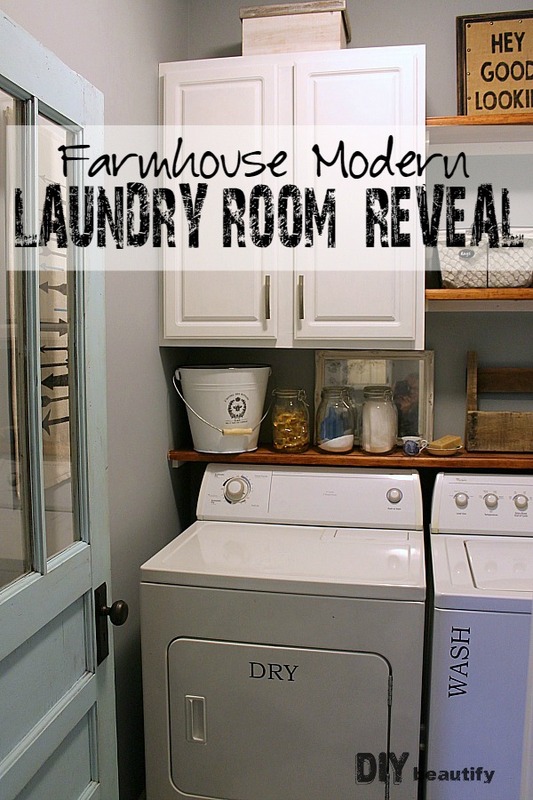 If you haven't see the before of this laundry room at DIY Beautify, you need to go check it out. Miracles on a budget. It would brighten my day to just open the door to this pantry. Not only is it clean and organized; it's so cheerful. I love what One More Time did with pallets in her laundry room. Lessons From the Lake calls this a pre-remodel. They updated this bathroom until they are able to remodel it. I'd be very happy with the updates and probably would never remodel. You need to go see the before. If you are in need of a baby gift, Wife in Progress has a tutorial for making this adorable framed chalkboard sign in Pic Monkey. Getting older is not all about doctor's appointments. You don't have grandchildren until you are older, and I have to say that my six grandchildren make getting older wonderful. I never dreamed that having grandchildren would be so much fun! Another advantage of getting older is that, after 45 years of working full time, I retired this year. How wonderful it is to be able to sit on the back porch and leisurely enjoy the singing birds, the sunshine, and even the squirrels playing. More time to relax and enjoy the beauty of God's world. I'm okay with a few extra doctor appointments. I'm even sort of okay with having hearing aids. The trade offs are worth it. Thanks for visiting, and have a relaxing weekend.